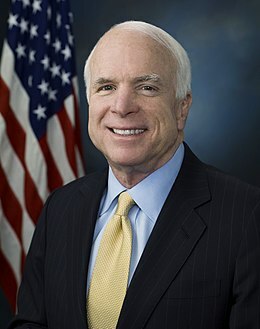 Tha John Sidney McCain III na riochdaire Arizona ann an Seanadh nan Stàitean Aonaichte. Fhuair e seachd bonn-cuimhne deug, fiù Silver Star, treasamh bonn-cuimhne as àirde ann an armailteach nan Stàitean Aonaichte. Dh'fhanaid Donald Trump a sheirbheis san arm: "'S fheàrr leam duine nach do ghlacadh a-riamh." Air a tharraing à "https://gd.wikipedia.org/w/index.php?title=John_McCain&oldid=539401"
Chaidh an duilleag seo a dheasachadh 24 dhen t-Sultain 2017 aig 16:46 turas mu dheireadh.